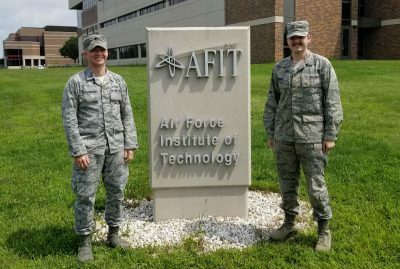 Cadet Mason Sorrell, right, completed an internship with Virginia Tech alumnus 1st Lt. Daniel Katuzienski, left, at the Air Force Institute of Technology. The U.S. Air Force expects to commission just 30 weather officers from the 1,900 students finishing ROTC programs this year. Virginia Tech, which offers a major in meteorology through the College of Natural Resources and Environment’s Department of Geography, anticipates that it will supply approximately 25 percent of those Air Force weather officers this year, more than any other university in the country. An Air Force weather unit is tasked with integrating current and forecasted atmospheric conditions into operations planning, as well as conducting and developing research in the field of meteorology. Burton is working to strengthen the crucial relationship between Virginia Tech and the Air Force by finding internships that will connect aspiring weather officers with former Hokies. Last spring, when Mason Sorrell, a member of the Virginia Tech Corps of Cadets and a senior meteorology major, raised his hand for an internship with the Air Force Institute of Technology, he didn’t know what to expect. However, when he found out that the researcher involved was 1st Lt. Daniel Katuzienski, he was glad to hear a familiar name. Currently a master’s student with the Air Force Institute of Technology, Katuzienski graduated from Virginia Tech and the Corps of Cadets with a degree in meteorology in 2015. His research focuses on developing radar forecasting techniques to better predict and mitigate lightning impacts on Air Force Space missions. Katuzienski then tested his lightning forecasting algorithm in the western deserts of Utah. The project required a great deal of data organizing and processing, and Katuzienski asked if he could recruit a cadet from Virginia Tech to help with the work. When Katuzienski sensed that Sorrell was getting bored cycling through data, he had the cadet practice running some of the programing code for the project. For Sorrell, the opportunity to do an internship at the Air Force Institute of Technology was an important first experience in what it will be like when he commissions into the Air Force. For Burton, this kind of internship experience is one that he would like to build on at Virginia Tech. Recognizing the important role that Virginia Tech plays in supplying the Air Force with critically needed weather officers, Burton would like to strengthen the relationship between Virginia Tech, Air Force operational weather agencies, and the Air Force Institute of Technology by increasing the number of internship opportunities available for cadets. Sorrell finished his undergraduate degree in December and commissioned into the Air Force in January. He attended the Weather Officer Course at Keesler Air Force Base in March and will be a commissioned weather officer at Barksdale Air Force Base in Shreveport, Louisiana, where he will do forecasting work for the southeastern branch of the Air Force.